Summer means spending more time outdoors–when was the last time you packed up a picnic? It can be difficult to be creative with food when you know it has to be transportable, flexible, and delicious. Pasta salad is a new favorite at my house. I have had my share of mediocre pasta salads at parties, and I can guarantee you this recipe is a winner (I got lots of thumbs ups and hi-fives when I put this dish on the table the other night for friends). 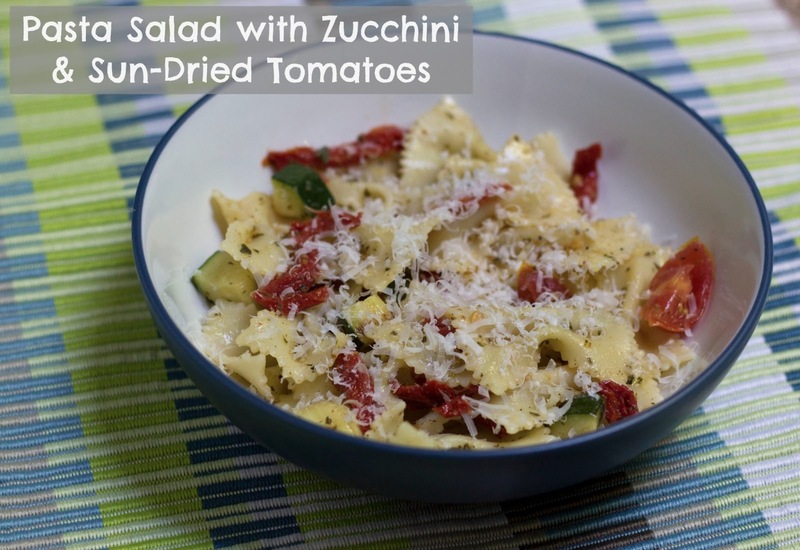 Remember that a pasta salad, so long as it has a great dressing, can be really flexible! Add in some grilled zucchini (because, let’s be honest, the grill is going to be fired up anyhow!) and sun-dried tomatoes, and you’ll have people going back for seconds and thirds. Before I bust out this recipe–have you signed up for the Portland Bloggers Picnic this Sunday? It’s going to be a blast!! Although this is a free event–RSVP is required as space is limited! Get your RSVP in here. Ok–now on to the food! After straining the noodles, place them in a large bowl on top of the quartered tomatoes. This will soften them. Combine all ingredients for the dressing and blend in a blender until smooth. Add to the large bowl the zucchini, olive oil, sun-dried tomatoes, and dressing; stir well to combine. Serve warm or cold. This recipe will keep in the fridge for up to five days if well sealed. Serves 8.